Feminist fans of the popular television show Gilmore Girls will be happy to know that one of its lead actresses has described the series as ‘sneakily feminist’. In a recent interview with Entertainment Weekly, Lauren Graham (aka Lorelai Gilmore) expressed frustration with the collective obsessing over the love lives of the Gilmore girls in the lead up to the Netflix revival this November. Graham told EW that ‘the show is sneakily feminist in that it’s always been great for them to have love, but they’re also okay when they don’t.’ Alexis Bledel, who plays Rory, agreed, telling the magazine that she was more interested in her character’s career trajectory than which of her ex-boyfriends might have her heart. There’s no denying that the show’s portrayal of the bond between mother and daughter was unique. Romantic dramas were often peripheral to their relationship with each other and their own successes and failures. In fact, perhaps the most tragic split in the series is not Lorelai and Luke or Rory and Dean, but the rift between the Gilmore girls themselves in Season Six. The show was far from perfect, but it did place a high degree of value on women’s lives outside of romance. Whether or not you agree that Gilmore Girls was feminist, Graham’s comments are worth considering, because they beg the question of whether popular culture is sneakily more feminist than many of us might think. At face value, many films and popular programs can seem like just another rehashing of tired gender stereotypes, but when you look beyond noisy trailers and glossy promotion, pop culture can surprise us. Take, for example, the US drama Nashville. As you might have guessed from the title, this is a show about country music singers, which will enter its fifth season in January next year. Its central characters are Queen-of-Country Rayna James (played by the always fabulous Connie Britton) and country pop sensation Juliet Barnes (Hayden Panetierre), and while they start out as rivals, the two develop a begrudging mutual respect and even end up supporting each other through various personal and professional battles. Britton as Rayna is a particularly strong character, and when she starts her own record label she makes it her mission to support female artists, railing against the treatment they receive from a chauvinistic major label executive. The show has also portrayed a character’s struggle with post-natal depression, an issue that is often swept under the carpet in mainstream discussion. Beneath the rhinestones and glitter, Nashville definitely has some sneaky feminism going on – so much so that in 2013, Salon asked whether it was ‘the most feminist show on TV’. Commercial Australian television might not be the most likely source of feminism, but the homegrown series Love Child has a palpable feminist leaning in its depiction of a maternity ward in a Kings Cross hospital in the late 1960s. With its third season airing this year, much of the series has focused on Stanton House, a home for young women who are pregnant and unmarried. In the first season, Dr Joan Millar (Jessica Marais) takes an interest in the welfare of the Stanton girls, while also battling against the prejudice she faces as a female doctor. Love Child is nostalgic for the clothes and music of the period, but it is not so starry-eyed about the treatment of the young women, who must fight to make their own decisions in a system trying to force them to give up their children. The show also depicts the experience of an Indigenous character, Martha Tennant (Miranda Tapsell), who faces additional discrimination after she gives birth. This series deals with difficult realities in Australia’s history, and it does so with sensitivity. Somewhat surprisingly, feminist themes are also being explored in mainstream cinema. This year’s How To Be Single featured Dakota Johnson as Alice, a recent college graduate who slowly but surely developed a sense of self not reliant on a romantic relationship. While this one could easily have gone the way of Amy Schumer’s Trainwreck, with the take-home message being that women would be much happier if they would just give in to a long-term relationship, HTBS ultimately validated female singledom. Even more recently, the admittedly outrageous Bad Moms provided a comment on the unrealistic expectations that modern society has of mothers, liberating its central characters from these tropes. While neither of these films could be described as radically feminist, they do share at least a hint of ‘sneaky feminism’. It seems that feminist themes can crop up in the most unlikely of places. But what is the value of so-called ‘sneaky feminism’? Is it a sign of progress in popular culture, or does it just mean a superficial version of the movement, watered down for mainstream appeal? Perhaps it is a little of both. While these films and programs might not feature feminist activism or a particularly groundbreaking view of the world, at least they offer a counter to narratives focused solely on heterosexual romance or that feature women only as one-dimensional supporting characters. Where much mainstream content continues to fall short, though, is diversity. Gilmore Girls in particular has been criticised for its overwhelmingly white fictional universe and its unsettingly frequent homophobic humour, and the other stories mentioned here also predominantly feature white actors, particularly in lead roles. If we’re looking for a feminism that is intersectional, ‘sneaky feminism’ on screen often leaves us wanting. 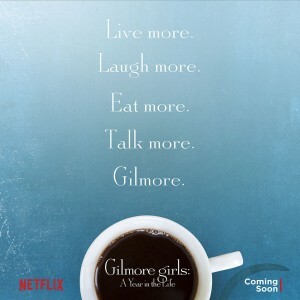 With many hoping that the new Gilmore Girls will address these types of problems, perhaps the revival will show us just how far popular culture has come in recent years – or, indeed, how much further we have to go. This entry was posted in Film, TV and tagged feature, feminism, film. Bookmark the permalink.